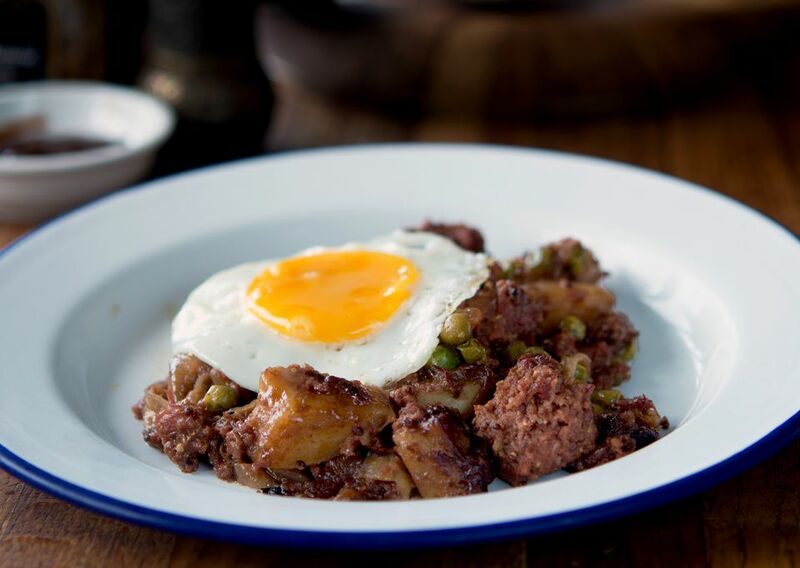 When you need a nourishing and comforting dish, little comes as close as a traditional British corned beef hash. This recipe is so simple to make and packs major flavor and comfort by the bucket load. Making a lovely lunch or hearty supper dish, it'll be on your Saturday afternoon lunch menu in no time. And if you happen to have any leftovers (unlikely), it tastes even better the next day. Corned beef in Britain is entirely different to that in the US, as more often it is canned, which is considered the British way. That is not to say that homemade corned beef would not work wonderfully in this recipe. It absolutely will. If you do decide you are going to use the canned variety, we recommend buying the best you can. It is well worth it in the long run, as the results will be so much better in both flavor and texture. Heat the butter in a large skillet or frying pan; it should be hot but not burning. Add the finely sliced onions and cook until they are melting and soft and just about to start turning brown. Add the potatoes to the pan with the onions and stir thoroughly, if there isn't enough butter to coat them, add a little more. Cook gently for 5 minutes, stirring from time to time. Add the beef stock, bring to a gentle boil, reduce the heat and cook for a further 3 minutes. Add the corned beef cubes, the Worcestershire sauce, mustard and cook for 20 minutes stirring with a spoon from time to time. From now on, take care not to over stir the hash or both the corned beef and potatoes will break up, try to keep them as intact as possible during the cooking. Once ready keep the hash over low heat, add the frozen peas and stir through. Leave on the heat while you cook the eggs. Heat the vegetable oil in a frying pan large until hot, but not smoking. Crack two eggs into the oil and cook gently for three minutes, carefully basting with the hot oil to cook the surface of the eggs, be careful not to overcook, you want the egg white to be firm, but the yolk soft. Slide onto a warm plate and repeat with the two remaining eggs. Divide the hash between four hot plates and top with a fried egg. Serve immediately with a dollop of brown (HP) sauce on the side (optional).